Mat work is excellent exercise(s) to do with Icelandic Horses. They are very receptive to it and seem to learn easily to "take your mark". It also makes training fun! for them and you! Click here to see a diagram showing the many training possibilities that can come out of mat work. I have had great fun seeing the many skills I can teach my horse while it stands on a mat. This exercise can lead to many desirable behaviors from the horse. Examples include the ability to stand quietly by your side while you talk to someone, smooth trailer loading, reliable ground tying, tolerance for new or different surfaces underfoot (trail riding), improved emotional control in new or stressful environments and more patience (duration aspects). The mat serves as a useful anchor while sacking the horse out, teaching it to automatically stand in good body alignment and teaching it show-ring stances. You can use any number of materials to practice mat exercises. At the clinics we tend to grab whatever is at hand. This might include a piece of plywood, a feedbag or a plastic lid from a supplement can. It is easier for the horse if the mat is a larger size. I personally bought a very inexpensive "welcome" mat designed for use outside the entrance of a house. The mat has a thin rubber backing and a cloth/matting surface. It is tough yet easily washable. To begin, ask the horse if it will step on the mat with one front hoof. Click/reward the first time the horse happens to land a hoof on the mat. Once it consistently steps on with one foot ask for both front feet. 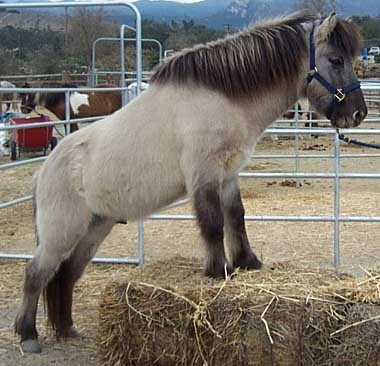 Initially the horse may object to a strange surface and try to go around or hop over the mat. This is normal. Just shape approximations of the desired behavior until the horse finally steps onto the mat with both front feet. Click/reward. Getting both feet to land on the mat at the same time may require repeated "step forward, step back" until the horse offers to halt on the chosen object. As an alternative to stepping forward and stepping backward, work on a small circle. Just walk the horse forward over the object in a circle until it lands a hoof on the mat. Keep working until the horse can consistently land both front feet on the mat. Next, you can extend duration of time spent standing on the mat by asking the horse if it can stand on the mat for one second. Try three seconds. Then try five seconds. Re-enforce for a gradual increase in the time spent standing still. Duration should be extended in a seesaw manner so that the exact number of seconds during any one trial is variable and unpredictable. My initial duration goal was 60 seconds. I reached that length of time by practicing this over the course of several training sessions. Achieving the first 10 seconds of duration is the most challenging and time consuming. Progress is much faster once the horse has learned the concept of standing still as you move away. Another task you can develop on the mat is preparation for ground tying. Start by asking if the horse can stand quietly on the mat while you move away from it at first only one foot, then two feet, and then three feet. Progressing in inches, instead of feet, may be necessary in the beginning. Ultimately you want to be able to stand at the end of the lead-rope and have the horse maintain its position on the mat. Then you can start varying where you stand at the end of the lead-rope. Possibilities include in front of the horse, off to the left and off to the right. Meadowlark is now working on standing quietly in the center of the arena on a lead rope with me 10 feet away while another rider trots and canters along the wall. This simply takes the basic exercise that is solid in the horse and adds new outside distractions that might take away your horse's focus on the task at hand. Remember to add distractions gradually. Don't ask too much too soon. Set your horse up to succeed by taking small steps. Only move on when the horse is very solid at the previous level. If your horse breaks, just go back a few steps and practice more. Eventually you might drop the lead to the ground, after the horse is very solid at the initial steps and you are in a contained area that isn't too distracting. Then you can ask the horse if you can move around it, behind it, away from it. You can extend this out to greater distances and longer duration until you have a horse that ground ties. My mare, Serena, now ground ties in the barn aisle for grooming, putting on and off blanket, and cleaning hooves. In fact, she will hold her position in the arena while I run to the tack room for something. That behavior evolved out of standing still on a mat. Another variation is to move your mat around. Start in a low-distraction area and then very gradually move the mat to a more distracting environment or a place that is a little anxiety provoking for your horse. Move in small increments from "safe zone" to "scary zone" so that the horse remains relaxed throughout the transition. Start out close to the horse and gradually increase duration of standing still. After duration is established for at least a full minute, practice increasing the distance between you and the horse. Meadowlark and I spend a lot of time on her mat in front of the open arena door (gate across) so she can learn to stand quietly while taking in all the sights and sounds from the yard and road. I have also practiced this in the barn aisle so she learns to focus on me rather than the bales of hay stacked next to her or the horse in the nearby stall. We practice versions of this exercise outdoors (on the lead rope), except I eliminated the mat. I just ask for quiet standing with face forward or head lowering while I move into different positions around her. The mat can be helpful for trailer loading. When Meadowlark sees the mat, her eyes light up and she hurries to go stand on it. By putting the mat inside the trailer and asking her to target her feet on the mat, she went right up the ramp and plopped her front feet onto it. The mat gave her a familiar anchor in a new environment. By combining the mat with targeting her nose to a bottle I had a powerful tool to overcome her anxiety about going into the trailer. The mat can be used for sacking out. Ask the horse if it can stand quietly on the mat while you put a towel across its neck, over its rump, and wherever else that appeals to you. Vary the materials used until your horse remains calm and still on the mat despite unusual objects approaching and possibly touching it. With enough practice, the mat starts to serve as an emotional anchor of familiar behavior for the horse. The horse learns that if it stands quietly, the goodies will come. Then it is more willing to be introduced to new stimuli while earning rewards. Once the horse gets good at this exercise, have some fun by asking him to place his back feet on the mat, instead of his front feet. You may need to alternate stepping the horse forward, then stepping it back until the horse happens to land a foot on the mat. Click that and jackpot! Shape for consistently placing one back foot on the mat, then both back feet, then duration, then overall position, just as you did for the front feet. A wonderful result of targeting the mat with back feet is that I finally achieved control of all four of my horse's feet through so I could line her up nicely for photographs. Meadowlark used to stop any old way. She might have a hip slightly turned out or one foot in front of the other. Now she lines herself up as delicately as a cat. If I let her know, through very tiny pressure on the clip of the lead rope, that she is not quite right she will correct herself so she is standing up square. Now both of my horses are tending to line up their feet automatically when I request a stand-stay or halt. They no longer require the presence of the mat to "square-up." By changing types of materials used as a mat, you can get a horse ready for riding in a trailer or riding out on the trail. I practiced with Meadowlark when she was still a foal, having her walk onto a large sheet of plywood laid out in the indoor arena. She became accustomed to the hollow sound wood makes. Then I taught her to go onto the board one step at a time, back off one step at a time and to stop at any point I asked, standing quietly. This exercise served as great preparation for getting into the trailer later. I worked on the same exercise with a thick plastic tarp. (Caution: be very careful that the horse neither slips nor gets its feet tangled in the tarp. It is critical not to rush the steps.) I also used this idea to teach her to walk through mud puddles so she wouldn't be finicky about water on her feet. She liked that game so much that she now seeks out mud-puddles to splash through when we go out in the yard! Mat exercises are wonderful for the Attention Deficit Disorder horse, the anxious horse, and the one that needs to constantly move. This exercise teaches patience and leads to emotional calmness. Getting control of each of the four feet on the ground through the lead rope is a prelude to getting control of each foot under-saddle. Speaking of under-saddle, it is great fun to teach the mat exercise under-saddle as well. Enjoy! This is not the mat, but the platform; similar exercise.